We are now accepting applications for children who turn 3 years old before 31st August 2019 to start in our Nursery in September 2019. We are now offering 20 full time places (9am–3pm) with before and after school extended day provision (8am-6pm) Provision is for term time only. There will be an opportunity to come and visit the school Nursery on Wednesday 13th February and Wednesday 06th March at 9.15am. Please telephone the school on 0208 340 2757 if you would like to attend. Applications for the Nursery to be submitted before 30th April. Our Nursery provides a happy, relaxed and stimulating environment in which children, through their investigations, play and talk, will gain the best foundations for future learning. We follow the Early Years Foundation Stage (EYFS) curriculum. Our Nursery staff work with children to help them develop into independent and confident learners. Through structured play and practical activities, children are able to develop the characteristics of effective learning which are the ways in which children engage with other people and their environment – playing and exploring, active learning, and creating and thinking critically. Details of the Early Years Foundation curriculum can be seen below. 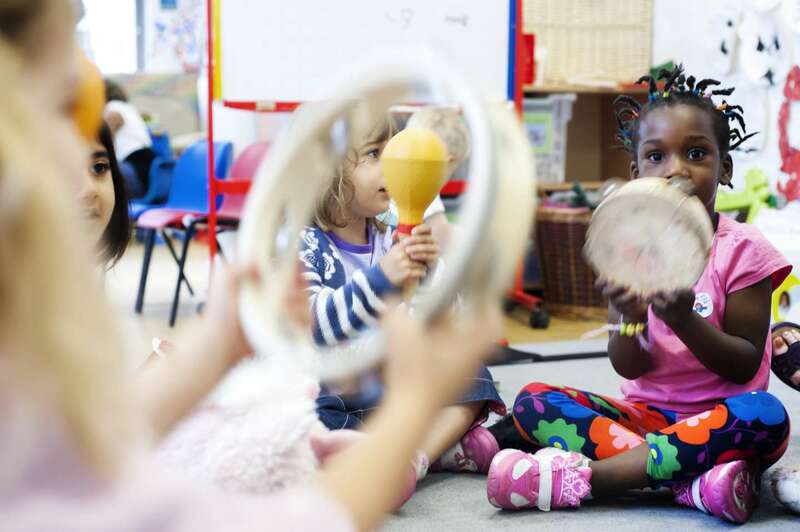 In addition to the 30 core hours, our full-time nursery children can attend the Early Years Breakfast Club (8am.– 9am.) and the Early Years After School Club from 3p.m to 6p.m.) at an additional cost. Please contact the school for further information. To apply for a nursery please visit our school to collect a Nursery application form. The best time to do apply is on or just before your child turns 2 and a half. Once completed you can submit it to the school Reception together with the originals of the following documents (we will take copies and return you the originals straight away. Please do not post the originals, it is better if you bring them in person). All children are entitled to 15 free hours of Nursery provision from the term after their 3rd birthday. Some children may be entitled to 30 hours free Nursery provision from the start of the term after their 3rd birthday. This scheme aims to help working parents, so families where one parent does not work, or both parents do not work, will not be eligible for the additional 15 hours. Each parent must earn, on average, a weekly minimum equivalent to 16 hours at National Minimum Wage or National Living Wage. For this scheme, the minimum amount will always reflect the lowest hourly rate that a person can legally be paid. Therefore, currently for a parent aged 21-24, you would need to earn a weekly average of at least £111.20. For a parent aged 25+, you would need to earn a weekly average of at least £115.20.